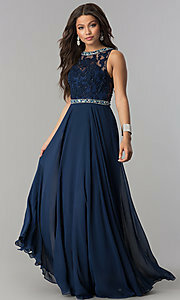 Sweep into prom wearing this romantic formal prom dress. Gorgeous lace applique sparkles with accents on the rhinestone-embellished high-neck bodice of the illusion-sweetheart dress. Adding to the charming look of the lovely long dress, a classic sweetheart lining and an alluring open-back detail provide eye-pleasing features. A shimmering jeweled waistband crowns the floor-length chiffon skirt of this beautiful evening dress. Offered in misses and plus-sizes, this budget-friendly chiffon prom dress, priced under $150, is ideal for wedding celebrations, galas or proms.